PMI-ACP® Exam was first launched as a certification for Agile project management practitioners on 31st January, 2012. Agile knowhow and the Agile body of knowledge has come a long way since then. In order to better and more properly align the ACP® certification with the new-look requirements of the Agile profession, PMI® has revised the exam syllabus of the PMI-ACP® certification examination that will be effective in its new version as a pilot run from 15 July 2015, for 3 months. Why A New PMI-ACP® Exam? As many Project Management hopefuls would be aware, PMI® has undertaken a Role Delineation Study to survey Agile practitioners from across the globe to determine how Agile professionals and organizations are specifying their job descriptions and responsibilities. Based on this study, the new findings are accommodated in the new PMI-ACP® Exam syllabus with an attempt to put the exam’s content on a par with real world practices. This recent update to the PMI-ACP® Exam syllabus will sustain the value of the PMI-ACP® Certification and make sure that the holders learn the relevant skills to successfully practice Agile as per the present scenario. 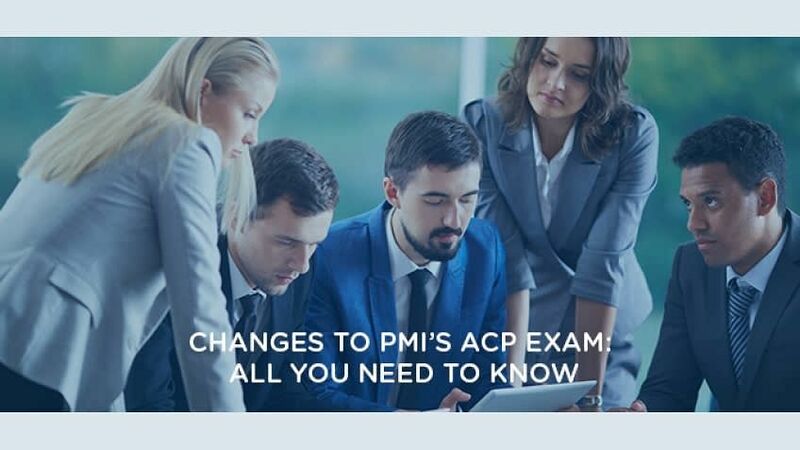 The Changes In The PMI-ACP® Exam- What’s New? Since most of these areas are part of the mainstream Agile body of knowledge, they are already included in the most current PMI-ACP® exam reference books and courses. All the changes are documented in the new PMI-ACP® Exam Content Outline. Also, the list of reference books for the PMI-ACP® exam has also been updated online, with the addition of several new books and the removal of a few. It is interesting to note that there is now a greater emphasis on “Kanban” and “Scrum”, along with the additional reference books on these titles. This trend was also noticeable in the knowledge areas of the exam questions of PMI-ACP® Exam candidates over the past year as an increasing number of questions have begun to appear on Kanban, Lean, and Scrum. PMI- ACP® Eligibility Criteria- Any Changes? Note: The latest update in the PMI-ACP® Exam does not affect the PMI-ACP® Exam eligibility requirements. Once the Agile practitioner qualifies, he or she has to fill in an online application form on the PMI® website to apply for the PMI-ACP® Certification. PMI® will review the submitted application to verify if the seeker fits to take up the exam. Such Audits on the PMI-ACP® applications may be done on a random basis. Important Dates- When can one appear for the PMI-ACP® Exam? 15 July – 14 October 2015: PMI-ACP® candidates can take up the new version of PMI-ACP® exam. However, the exam result and scores won’t be out immediately, even if they appear for the computer-based exam. This is because PMI® takes time to assess the suitability of the exam questions and adjust the passing rate. Results can be expected by 22 October 2015. From 15 October 2015: From here on, PMI-ACP® candidates will receive the exam score immediately for the new PMI-ACP® exam.